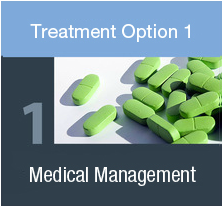 Participants will be randomly assigned to one of these three treatment methods. You will be prescribed a medication, in most cases aspirin, to prevent blood clots and stroke. You will have periodic blood pressure measurements and blood tests. You may be prescribed medication(s) to control your blood pressure and cholesterol levels. If the medications that are prescribed as part of your participation in this study are not covered by your insurance, they may be provided to you by CREST-2 at no cost. You will be enrolled in a risk factor-management program called INTERVENT. You will have a 15- to 20-minute phone call with your INTERVENT coach to assess lifestyle factors such as tobacco use (by far the most important), physical activity, body weight, and alcohol use. You will continue to work with your INTERVENT coach through periodic phone calls to manage these important risk factors for stroke prevention. Every six months thereafter for up to four years. 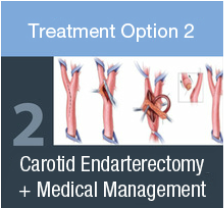 Treatment method 2 involves intensive medical management used in combination with a procedure called carotid endarterectomy (en-dar-ter-EK-ta-mee). Carotid endarterectomy is a surgical procedure to remove the plaque buildup in the carotid artery to prevent stroke. Carotid endarterectomy has been the standard of care for the treatment of carotid stenosis for the last 40 years. 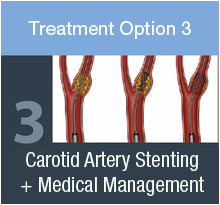 Treatment method 3 involves intensive medical management used in combination with a procedure called carotid artery stenting. Carotid artery stenting involves using thin, tubular instruments (catheters) that are guided into the carotid artery through a large artery in the groin. A catheter is moved to the narrowed portion of the carotid artery and then typically an umbrella-like filter is opened above the narrowed section of the artery. This filter acts to decrease the chance of cholesterol or other material dislodging, blocking a vessel and causing a stroke. After the filter is opened, a balloon is then inflated to widen the narrowed vessel. Once balloon angioplasty is done, a metallic stent (an expandable mesh tube) is placed at the narrowed site to hold the artery open. Carotid artery stenting has been a common treatment for carotid stenosis for the more than 20 years.